The Smart About Salt Council was thrilled to have its Essentials of Salt Management Program recognized with the Lake Simcoe Regional Conservation Authority Education Award on October 16, 2015. Board Chair, Eric Hodgins was present to receive the award and participate in the wonderful evening that recognized environmental leaders in a variety of categories. On January 9th, 2012, the Ontario Parks Association recognized the Smart About Salt Council and the Regional Municipality of Waterloo with its Protecting Tomorrow Today Award. The Awards were presented at OPA's Annual Awards Luncheon in Toronto. The award was given "in recognition of your significant contribution to the betterment of our parks and the overall environment, through your leadership in protecting underground water systems and water courses in the Province of Ontario". The Executive Director of the Smart About Salt Council accepted the award on behalf of the Council. "We are working with a number of municipal parks departments and Conservation Authorities to improve winter maintenance practices and reduce the environmental effects of excessive salt use. We are honoured to receive prestigious award" said SASC's Executive Director. 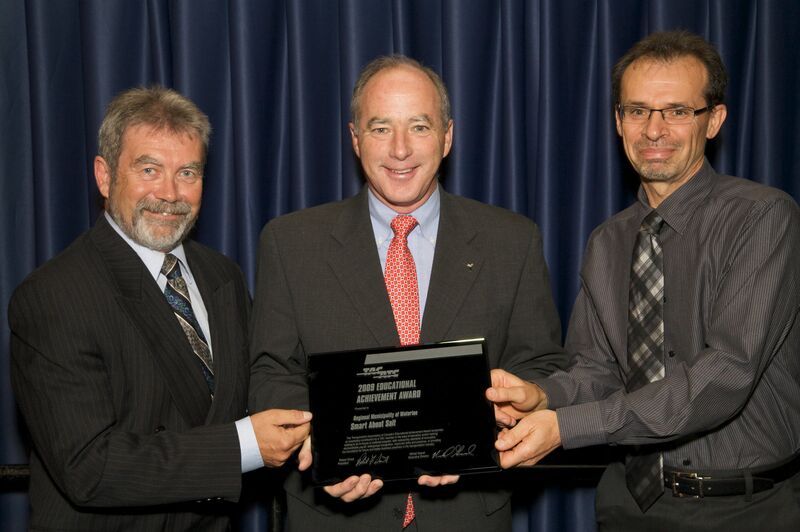 The picture shows the award being accepted by Bob Hodgins (left), past president of Ecoplans Ltd, co-designer of the program and past Executive Director of the Smart About Salt Council; and John Hammer (right), Director of Transportation, Region of Waterloo. The Award was presented by Ray Mantha, Executive Director and Chief Engineer, Ministry of Transportation Ontario.